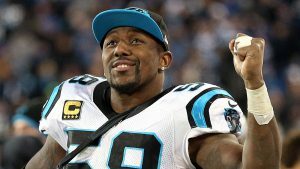 Carolina Panthers Thomas Davis was announced as the keynote speaker for this year’s Entrepreneurship Summit that happened last month on April 7th at the Givens Performing Arts Center. The event began at 11 a.m. and lasted for three hours, which allowed for a good chunk of time for the athlete to discuss how he created opportunities for himself and others can do the same. It was a very motivational talk and was able to hold the audience’s attention with every minute that he spoke, and he was a perfect fit for the summit as the theme for this year was “Creating Opportunities for Yourself”. The Shellman, Georgia native got his start in sports at a young age when he was a part of his high school football team. This helped him earn an athletic scholarship to attend the University of Georgia where he played under Coach Mark Richt. He entered the 2005 NFL Draft where he was selected in the first round as the 14th overall pick by the Carolina Panthers with whom he still plays for. The 2015 NFC Champion is the winner of this year’s “Whizzer” White NFL Man of the Year award. Davis spoke at the summit that took place at UNC-Pembroke last month and did an excellent job of inspiring the audience to find new ways to create more opportunities for themselves. If your company is interested in finding out availability and booking fees for a NFL player like Thomas Davis or other celebrities for a Keynote Speech, Autograph Signing, Football Camp, or Fundraiser, call us at 1-888-246-7141.